Prior to the 2018 WNBA Season, Blake Dietrick had only logged a total of 14 minutes in three games for two teams in the league. Signed as a free agent in the offseason, Dietrick earned a spot on the Atlanta Dream roster and made the most of her opportunity. A standout guard from Princeton, Dietrick is the type of player every coach loves on their roster. A player that goes hard every rep and runs the plays as they are drawn up. She played in 26 games for the Dream and averaged 1.4 points in 7.2 minutes per contest. She shot 39.1% from three-point territory, hitting some big shots for the team during the second half of the season. Dietrick became someone Coach Nicki Collen can trust when the team needed her. Late in the Dream’s game against the Los Angeles Sparks on August 9, Collen called on Dietrick to in-bound the ball on the sideline. 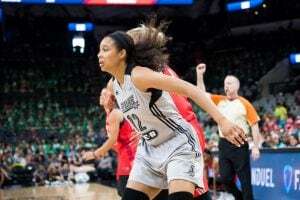 Usually this task would go to two-time Olympic Gold Medalist Angel McCoughtry, but with the star out due to a knee injury, Dietrick was slotted in to the role as former league MVP Candice Parker was guarding her. Some young players would freeze in the moment but Dietrick showed her toughness, got the ball in and helped lead the Dream to a win. 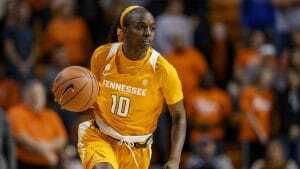 Fans can follow Dietrick this offseason as she plays for Gernika in the Spanish Women’s Basketball League.